A station for tea inside the new Giant Heirloom Market at 23rd and Bainbridge Streets. Giant Heirloom Market, the first urban format store from Carlisle, Pa.-based Giant Food Stores LLC, will open at 7 a.m. Friday at 23rd and Bainbridge Streets, bringing nearby residents kombucha on tap, a produce chef to cut vegetables and fruits on demand, a sampling station, and a place to create your own olive oil and vinegar blends. The first 250 customers to arrive will receive a free Giant Heirloom Market tote bag. There will also be free samples and demonstrations throughout the day. The 9,500-square-foot store will be open from 7 a.m. to 10 p.m. seven days a week and provide about 60 full- and part-time jobs, the company said. It will have self-service and mobile checkout options, along with iPads to place orders for items not in the store, to be delivered the next day. 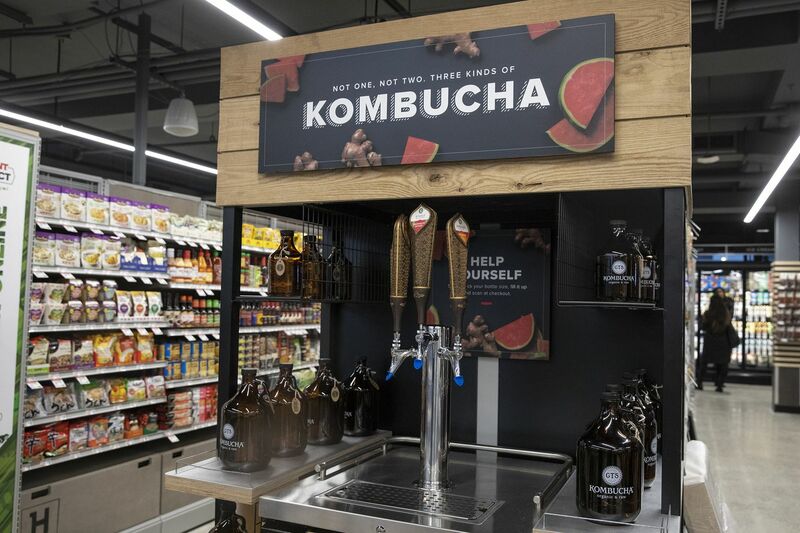 The new store is part of a trend of grocery retailers trying to reach city residents by increasing their presence in urban mixed-use projects. When creating the concept for the smaller-format store, Giant found inspiration in Amsterdam’s smaller grocery stores (Giant is owned by a Dutch company), and used group listening sessions in nearby neighborhoods to design a store to meet the needs of the local community. “We’ve had the privilege of getting to know our neighbors, and they are the true inspiration for our new store,” manager Angel Cordero, who has worked in the grocery business for 20 years, said in a news release. “I am thrilled to soon officially open the doors to Giant Heirloom Market, and I’m sure our neighbors will be just as excited to experience a store that connects them to real food, where every trip will inspire them to eat better —and for less." Giant, which has more than 170 stores in Pennsylvania, Maryland, Virginia, and West Virginia, announced plans for the Heirloom Market concept during its 95th anniversary celebration at Dilworth Park in October.